Where are you, Mister Prime Minister, when your people need you? Headlines, juxtaposed, stare back at me in the morning paper. I am reading it, still shaken by the events of the Abbas Town Blasts. The sky on this Tuesday morning is tinted a strange reddish strain. Maybe it’s just in the minds of traumatised Karachiites who cannot get over the blood spilled in Abbas Town– blood that has still not dried. 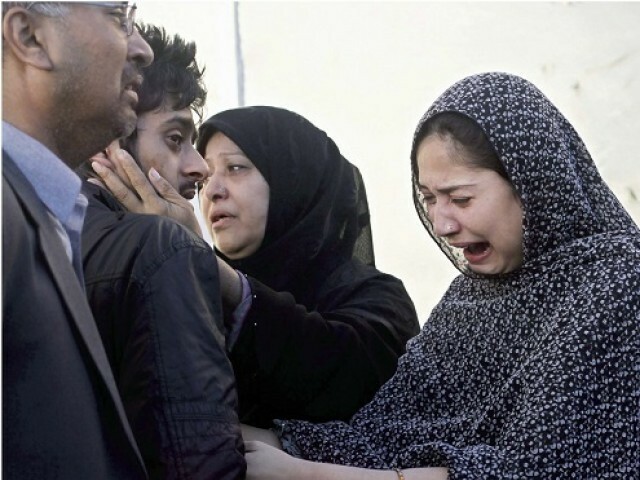 Fumes of that blood are now being breathed in also by residents of the hitherto protected upscale neighbourhoods of Karachi who live in fear of their daughters and wives being kidnapped. We are talking about the blood of the (at least) 48 dead and 140 injured – shops and homes burnt, families displaced, children lost. Broken toys and burnt textbooks and scattered around. Glass panes through which they used to see the world are now lying as broken shards. Torn dupattas, molten electric wires, blistered dreams and mangled photographs of families smiling on Eid decorate the ground. Yes, the sky is a little reddish today, especially after the funeral procession also came under fire. Even the dead can no longer rest in peace, not because of their own sins, but because of the sins of those who are still alive and armed. With all due respect, it is not your going to Ajmer Shareef that is the problem, sir. Refreshing spirituality, washing sins and praying is as much your right, sir, as is mine. It is the timing! It is the fact that you never cared to visit the site of the blast. Neither did any other bigwigs, the maai baaps, the rulers and movers and shakers who rule and move while our very fabric is shaken up. However, enough has been said about that. We, the citizens of Pakistan, know now more than ever that we are on our own – abandoned, unclaimed. We are independently left alone to clean up the mess after every carnage. The message “abb khud kuch karna paray ga” (we must do something now) stares at us in the face. We really don’t have a choice. We no longer trust the promises of getting Rs 1,500,000 each for the families of the dead and Rs 1,000,000 each for the injured. Even if, as part of a huge hypothesis, the amount reaches the deserving hands, will it bring the dead back to life? And wouldn’t it be a band-aid too late, even if it does arrive? Meanwhile, emotionally drained and angry Karachiites channelise their anger like they should. They vent on social networking sites and outside dhaabaas incessantly, for the sake of their own sanity. They agitatedly argue about how to react to this; they debate the “what next”; they talk about the ugly head of civil war expected to raise its head. They talk about how it is finally a sad fact even the most patriotic ones of us have to accept that yes, I’d rather let my child become a part of Pakistan’s brain drain. Let the mass exodus begin. For it is no longer time to say “kaheen Karachi Beirut na bann jaye”. Guess what. We’re already there, but are in denial. Still, all is not lost! We, the Karachiites, right from Dalmia to Defence,are doing what should be done, and what little is in our power. We stage peaceful protests and raise awareness and collect donations in cash and kind. Our students are tear-gassed and baton-charged and arrested for protesting because the real criminals are a league above – they cannot be laid a finger upon. The awaam still continues to be resilient. Within 24 hours, 60 bags of blood are donated just outside the phase IV Imambargah Yasrab. Within 24 hours, one million rupees are collected. Within 24 hours, shelters are set up and food, medicines and clothes are reaching the effected. Expats are desperately trying to wire money across to Pakistan. On Sunday night, I got a call from a friend who was weeping because she, after volunteering all day for the victims, still wanted to do more, and wanted to know how she can do it. I see friends at work rushing out for an hour between work timings to donate blood. I know of parents who train their young children by making them pack boxes for the effected. It’s not much, we all know, but this is all we can do. What is most heart-warming is how the miscreants lost a battle there and then when Sunnis of the area opened their homes for their Shia brothers. Abbas Town blasts may be the worst that has happened top Karachi recently, but may bring out the best! On Monday night, a friend messaged me, sharing how many members of the Shia community who had saved up money to go for Ziarat to Karbala, have decided to donate the money towards the rebuilding of the damaged homes. There are firstly whispers and then more vocal suggestions that money saved for Umrah could be used for the same – suggestions coming from Sunnis. Mr Prime Minister, you and your comrades could learn a thing or two here, don’t you think, sir? For me, the biggest silver lining is this: with each consecutive catastrophe, we become braver and more vocal and fearless. We no longer speak in hushed tones. We are saying no to silence as a nation. Posted in In The Loop, Karachi, Straight From The Heart and tagged Abbas Town Blasts, Karachi, Karachi violence, Raja Pervez Ashraf, Shia Genocide, Shia killings, Shia Sunni. Bookmark the permalink.